When Robert Kincaid drives through the heat and dust of an Iowa summer and turns into Francesca Johnson's farm lane looking for directions, the world-class photographer and the Iowa farm wife are joined in an experience of uncommon truth and stunning beauty that will haunt them forever. Oh. My. God. Utter drivel. Purple prose. A train wreck of a book. I couldn't not read it because it was so appallingly bad that I just couldn't look away. The "Plan 9" of novels. Is this what is known as a Gary Stu? Anyway - sentiment spread thickly on a slice of pasteboard. It got me through three waiting room hours, but then I had to admit to having read it, which produced exactly two kinds of responses: "I'm sorry" or "Robert Redford." Everytime I read this book if moves me so deeply, a love story so intense that the passion is felt inside me, a simply story yet it reaches deep into my soul and touches it in a way no other book ever has. 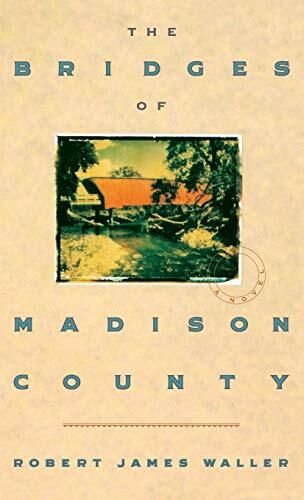 The Bridges of Madison County. It just has such a romantic connotation and I think it always will. Maybe not so much because of this novel but more for the experience I shared there. I read this book because my sister in law got married here. I wanted to get the full feel of the place and why it was famous for being a romantic landmark. I'm not going to say much about the book. I didn't really like it much. It was sort of idealistic and blabbered on and on in flowery language about love and what it meant to Francesca and Kincaid. Who were having an affair, by the way, no matter how pretty the words are to describe it. I've heard the movie was better...I'm willing to give it a shot. Very moving, a true love story where you want the couple to succeed even though they are adulterous. This was one of the first books that actually made me cry! A beautifully written love story. Very romantic. The portrayal of characters and the first person narration is superb. Though the story is slightly beyond the realms of reality, it explains something which could happen to anyone. It is all about this lady, Francesa who meets the man of her dreams when she is already married and a mother of 2 kids. I worked in a bookstore during the frenzied craze surrounding this book. I resisted for about a year, then finally read it. It just wasn't very good. When I heard a movie was being made, I had extremely low hopes; however, the movie turned out to be surprisingly well done. An easy read, an interesting story, yet one wonders why women are all agog about this story. If ANY man did what this woman does would be road kill. Raises some very interesting questions between the sexes. What a beautiful, wonderful love story, the kind of love that lets you go but still not want to do so. The kind of love that transcends everything. The kind that just can't really be real until it happens to you. I picked this up shortly after it came out in paperback. The quintessential "throw across the room" book. When a meal shared by the lovers-to-be was described as "quiet food", I should have stopped there. Yet I wasted more time before actually throwing it. I saw the movie first, but it did not ruin the book. It was a great read. this is a lovely book. written in such as way that I am not certain whether it is based on fact or is complete fiction. The idea that love could be that strong that even with no contact it could last so long for both of them. It is also quite short and easy to read so reccomend to all. I read this book for a TIOLI challenge. One of my categories for the 12 in 12 challenge is to read some books for TIOLI. I did this one because it was short and I knew I could read it in about 5 days. I did just that. This is the story of a woman and a man that she met one day. Francesca and Robert. Francesca is a farm wife and mother. While her husband and children are at a state fair showing their prize cow Francesca meets Robert Kincaid and photographer. When she sees him for the first time she feels drawn to him. As I read the story I felt the attraction between the two of them. I was feeling her loneliness and lack of love from her marriage. She loved her husband but was still missing something and Robert Kincaid brought that yearning to the front. This edition titled:'Love in black and white. Moving, spare, brief encounter love-story. Amazing sense of place and characterisation. Read it and weep. Someone gave me this book when I it was as popular among women as 50 Shades of Grey is today. I shoved it aside, and somehow stumbled upon it just the other night. Since I'm older and wiser, I figure it might be a good time to read it and get it over with. I also want to see what all the hype was about. I finished the book in a bit more than an hour. On of my all time favourite books, and I put the film of this in the same category. It's not often I enjoy the film as much as I did the novel, but this is one of those occasions. A story of impossible love, that has you pulling your hair out, wishing that they would go off together, but no…….. I saw the movie years ago and recently picked up the book second hand. So I knew it was a love story. I relish good love stories and have read many whether classics, chick-lit, comic, young adult, paranormal romance...the list goes on. I read them and read, generally speaking, for the joy, hope, fun, dreams, adventure, sadness, excitement and escapism that they bring to me. Honestly proud to be a sap, nothing like a bit of unbelievable corny romance for a bit of fun. They make you hoot with laughter, blubber like a baby and cringe like a teenager, some even steam you up like?..yes well, you can imagine. Despite any tendencies towards cynicism, I still believe in romance and we can all use more of it in our daily lives, where ever we may find it. Surprised that so many found this book dreary. I felt it to be powerful and intense, sad and lonely, painful in a melancholic way and beautifully simple in a very strong way. There are so many who have just what they settle for in life and relationships. To find someone, even briefly, who helps you to ripen and blossom physically, emotionally, intellectually, even spiritually, can only be magical. In Like Water for Chocolate by Laura Esquivel, it is described as being like a box of matches. There are only so many and even fewer who can set the sparks free. It would be sad indeed to go through life never experiencing such a sensation. When was the last time you stayed up all night just talking to someone, oblivious to time, to everything, except that person? When was the last time you felt appreciated in such a way?